I want to thank you for the awesome job you did in reproducing the books that I inherited from my grandfather AOM2c Lloyd George. He was truly a great man. I will now be able to share his history with my kids and family without worry of the original copies being destroyed. I would also like to thank you for the great care you took in handling and shipping the original copy’s. Hopefully by having these copies in your database other families will be able to find their sailors. If your search for a particular Cruise Book is coming up empty, or the cost is beyond a reasonable fee, here is an alternative source, Frank Arre, “Classic Cruise Book Reproductions”, http://www.navycruisebooks.net. Just received my 1965 USS Mitscher DL 2 order. This is not an original book, but a reproduction copied, then placed in a spiral folder, from a original cruise book. Very pleased both with the final results and Frank’s due diligence executing my request. There is a lot of background that occurred prior to using the services of Classic Cruise Book Reproductions, but I’ll make it pretty short. I had been looking for my boot camp yearbook (“The Keel”) for over 19 years and when I finally located a copy of it, my shipmate wanted the original book back to give to his son to remember him by. I was fine with that and so he trusted me and sent his copy of “The Keel” to me. I knew I had to be careful with his book, but I also wanted a copy for myself…luckily I knew exactly what I wanted to do. 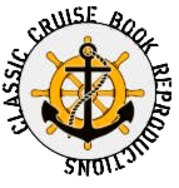 I first became aware of Classic Cruise Book Reproductions about 4-5 years ago when a friend of mine that had been in the Army used the services of Frank Arre’s reproduction service. One of his boot camp buddies had lost their copy and my friend still had his copy and sent his book to Classic Cruise Book Reproductions to have a copy made. When he got his copy back, he showed it to me and I was very impressed with the professional look of the book, but also the quality of scans and printing of the book. NOTHING ever replaces the original, however for a copy, this was GOOD STUFF. And although at that time, I did not have a copy of my own boot camp book, I made sure to save the BOOKMARK on my computer should I ever find a copy of my own book… but after 15 years (at the time), I was not hopeful I would ever find a copy of my own book. Fast forward, and a LOT of research another 4-5 years…I found my copy. I contacted Frank Arre of Classic Cruise Book Reproductions by email and he called me within a couple of hours. We discussed what I had, what he could do and the cost. I was fine with all of the options and decided on 2 HARD COPIES (pages printed on high quality paper and bound with a comb binder) and 2 digital copies on a CD with the high-resolution images. I instructed Frank that I needed for one set (hard copy + digital copy) to be sent to my friend along with the original book. He said this would not be a problem at all. I think when it was all done, the work was completed within a 6-day time period, and that included my ship time to him and his shipping time back to me. VERY FAST SERVICE! He also provided the tracking numbers so I would know when to expect the book. When the package arrived, it arrived in a box that was packed very well. The package included both my bound book and the CD. Thumbing through the book, it was basically like looking at the original book. The scans were very well done, the quality was excellent and the printing was also very good. Again, it was the NEXT BEST THING I could have next to the original copy. Next I took the CD to my computer and was pleasantly surprised that the images were not only numbered, but the entire book was in the same ORDER as the book itself and each image was a HIGH QUALITY scan…including the FRONT COVER and BACK COVERS a nice added bonus. All in all, this was the absolute best I could have expected and Frank Arre with Classic Cruise Book Reproductions delivered exactly what I was hoping for…I highly recommend Classic Cruise Book Reproductions for any reproductions services regarding these cruise books, boot camp books… and probably ANY kind of yearbook type book for a high quality reproduction for sharing or having a copy for yourself. It was a pleasure doing business with Frank and his company!